Located on the West Coast of Saint Lucia, Soufriere is a town of many wonders and has an illustrious history. This town of roughly 7,935 inhabitants was the originally the capital of the island when founded by the French but after being invaded by the British, it lost this title to Castries. This has not stopped noted royalty from visiting this awe-inspiring town. This group includes the future Empress of France, Josephine de Beauharnais, who spent most of her childhood living in the area. Not to mention, George Charles who was the first premier of Saint Lucia and Queen Elizabeth II who landed in Soufriere when she visited in 1966 rather than the current capital of Castries. Originally known for its agricultural benefits, this seaside town has been transformed into a top tourists destination. 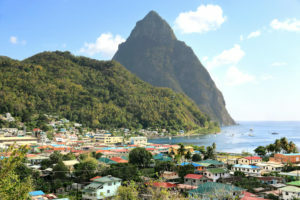 Its mountainous landscape and tropical year-round climate makes draw tourists to Saint Lucia but Soufriere lays claim to the island’s most famous landmark, The Pitons. Gros Piton, climbing 2,530 feet high, and Petit Piton, at 2,438 feet are a UNESCO World Heritage Site and are connected by the Piton Mitan Ridge. The Pitons serve as volcanic plugs but that has not stopped hikers and curious tourists alike from visiting this breathtaking landmark. The mountains are so popular that Windward & Leeward Brewery, a local beer brand, named their lager after the heralded site. The equally impressive drive-through volcano, Sulphur Springs is home to numerous fumaroles and hot springs.The Sulphur Springs are located on site of the dormant yet geothermally active Qualibou volcano and is a famous spot for tourists to enjoy a toasty mud bath that is considered to have medical purposes by local residents. Soufriere, Saint Lucia may be small in size but offers a multitude of attractions and ways to view them. Allow us at Dave Charles Taxi and Tours of Saint Lucia to provide you with an unforgettable tour of Soufriere. Located near Hewanorra International Airport, we provides reliable, honest and safe transportation throughout the island that’ll leave you begging to stay. Call us at 1-758-715-3573 or use our form online to book a taxi, tour, or custom island adventure!